Please respond to each question and provide as much information as possible in each section. Add additional sheets if necessary. If you already have a bill drafted, please attach it to this form. Proposals must be good public policy for the department; must address the department’s operations, programs, regulations, processes, budget and/or resources; and must create a benefit or an advantage for the department, the trust, or trust beneficiaries, or otherwise correct a current deficiency. DHHL staff will review and evaluate all proposals and will determine which will be submitted for consideration for the Governor’s Administrative Package. The proposals to be submitted to the Governor will be approved by the Hawaiian Homes Commission. Proposals not submitted to the Governor may be introduced independent of the administrative package. 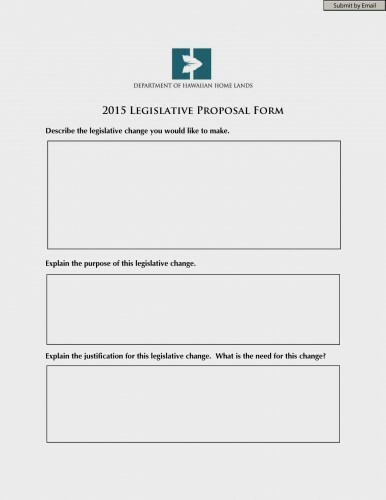 Completed proposal forms must be submitted by e-mail no later than July 31, 2014 at 4:30 p.m. HST. Please e-mail completed forms and any questions to Dre Kalili at [email protected].